DaBella bathroom remodels in Olympia are performed only by factory trained installers. Revamp your bathroom with beauty, quality, strength and safety. As a recognized bathroom remodeling expert in Olympia, DaBella offers numerous tub and showers options from BathWraps, one of the fastest growing acrylic bath manufacturers. BathWraps product offer added protection to prevent the growth of mold and mildew. Our factory trained installers are ready to reinvent your home’s look with a bathroom remodel. 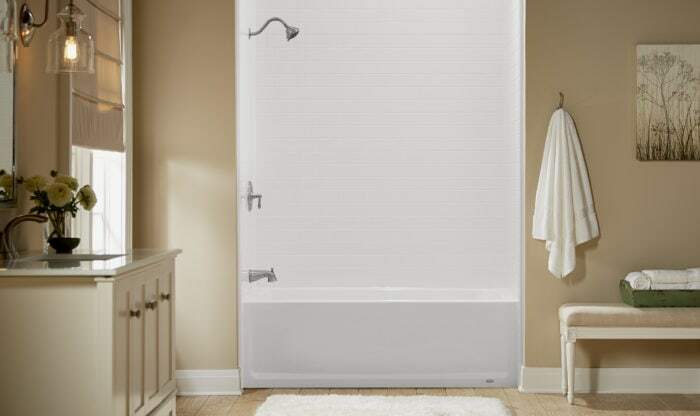 Open the door to all the possibilities with an array of bathroom conversion products. Our American-made bathroom replacement systems will transform one of the most important rooms in your house in as little as one day. Your home is your most significant investment and you deserve to relax in peace knowing that you have a bathing product that is dependable. BathWraps products installed by DaBella include innovative features such as Silver Shield Antimicrobial Protection: a system that will prevent bacteria, mold and other microbes from growing. If bathing safety is a priority for you, DaBella is the obvious bathroom remodeling expert of choice. We can revitalize one of the most important rooms in your house and equip it with safety features to increase independence & comfort. Debra S. & Jeannie B.
Upgrades to our two bathrooms are beautiful. The upgrades to our two bathrooms are beautiful. Your products are very high quality and have added comfort and value to our home.